We are a leading Manufacturer of electronic rail weighbridge, rail weigh bridge, rail static weigh bridge, static rail weighing system and rail weighing system from Chennai, India. The state of art highly sophisticated yet simple in-motion weighing system has been designed and developed indigenously. With conventional systems, each wagon has to be uncoupled from those adjacent to it, and then carefully positioned and parked on the weighbridge before its weight can be recorded. Weighing is crucial to cost-control and safety in virtually every aspect of business operation from monitoring product deliveries to avoiding overloading penalties. Often located in remote or harsh conditions, weighing systems need to be in place with minimal disruption to normal traffic. Freight may need to be weighed at high speed as many customers operate a huge variety of locomotives and rolling stock. Our Indicator is innovative system is designed to detect the different type of wagons to initiate the axle or bogie weighing. Also it automatically detects the different type of engines and eliminates its Weighment. The speed of wagon is directly related to the accuracy of weighment. The high speed A/D Micro Controller are having a remarkable compatibility to achieve accurate weighment even up to a speed of *15KM/hr. Owing to our experience and knowledge of this domain, we have been able to offer optimum quality Rail Static Weighing System to our valuable customers. These systems are precisely engineered in adherence to the international quality standards by using ultra-modern machinery installed at the state-of-the-art infrastructure. Due to their high performance, hassle-free operations and zero maintenance, these systems are highly demanded. We manufacture and supply precision Rail static weigh bridges for railway wagons. our rail static weigh weighing scales are the most accurate on the market, giving you peace of mind in the safety of the people, our systems greatly benefit offering a multitude of tests ranging from individual wheel weights, axle, bogie, wagon and full train weights. Senlogic Combo rail in motion weighing system designed in accordance with the worldwide requirement RAILWAYS/RDSO. The system design is very Simple yet powerful, allow you to install the system in short span even at a very narrow curved line. 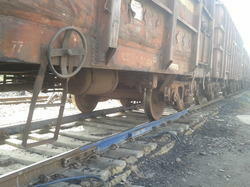 The system has been designed with new and simple algorithm to deduct complex engine and wagon’s track pattern. The improved Rail Sensor design allow our combo rail fit for even short span of Straight Line requirement even less than 45Mts . The user has get wide choice for the software, inter connectivity vie Ethernet, GMS, USB. The system can be simple pit and pitiless design. 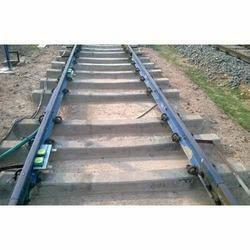 Looking for Rail Weighing System ?